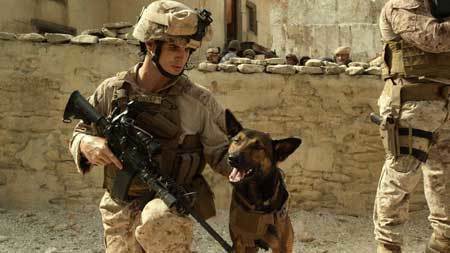 Army dog Max comes to rescue when his human handler, U.S. marine Kyle Wincott, becomes fatally wounded - find out more in the Kidzworld Blu-ray Review! A precision-trained military dog, Max serves on the frontlines in Afghanistan alongside his handler, U.S. Marine Kyle Wincott. But when things go terribly wrong on maneuvers, Kyle is mortally wounded and Max, traumatized by the loss of his best friend, is unable to remain in service. Sent stateside, the only human he seems willing to connect with is Kyle’s teenage brother, Justin, so Max is saved when he is adopted by Kyle’s family. But Justin has issues of his own, including living up to his father’s expectations, and he isn’t interested in taking responsibility for his brother’s troubled dog. 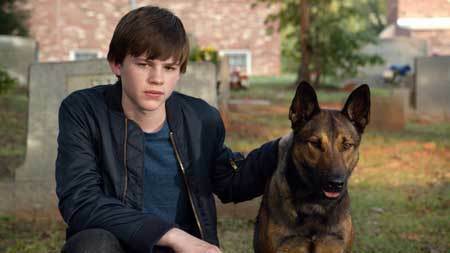 However, Max may be Justin’s only chance to discover what really happened to his brother that day on the front, and with the help of Carmen, a tough-talking young teen who has a way with dogs, Justin begins to appreciate his canine companion. Justin’s growing trust in Max helps the four-legged veteran revert back to his heroic self, and as the pair race to unravel the mystery, they find more excitement—and danger—than they bargained for. But they each might also find an unlikely new best friend…in each other. Exclusive Clip "Working With Max, Acting with Animals"
You've heard of War Horse? Well, this family flick is basically "War Dog." Everyone loves a movie where a pooch comes to the rescue, but Max proves to us just how "man's best friend" earned that title when our lead canine saves the day after his handler, U.S. Marine Kyle Wincott, finds himself fatally wounded and emotionally scarred by the loss of his best friend.It takes a sassy teenager with who has a way of talking to his furry friend to unlock the real events of the day he was injured. To say this film is emotional would be an understatement! 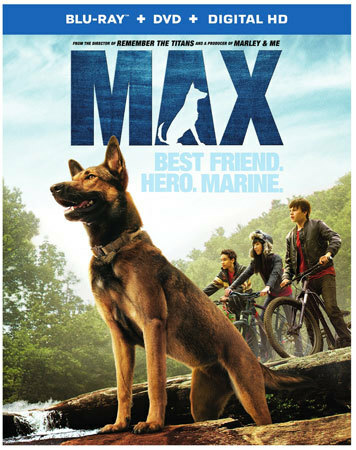 Destined to be best friends Courtesy of Warner Bros.
Like any family-friendly dog movie, there aren't that many plot twists you won't see coming, but luckily Max is a good enough story that you won't even mind. If you're a dying to see more dog tricks, the Blu-ray comes with some bonus barks - a behind the scenes feature on the multiple dogs who play the title character, and a different behind the scenes about real rescue dogs in the military. It's a great pick for watching with the family, or spending the night with your friends or younger siblings. Max is now available on Blu-ray and DVD Courtesy of Warner Bros.
Have you seen Max? What did you think? Let us know in the comments section below! Fave Kind of Dog? Vote! Dog shmog, gimme a cat!